Martin Wolf is the chief economics commentator at the influential Financial Times. He has received numerous honorary awards, positions, and degrees. My first knowledge of him came from a friend who had attended a lecture where Mr. Wolf mentioned that the best research on real estate economics was being done in Auburn, Alabama. I was quite shocked that Mr. Wolf was following our work here at the Mises Institute. However, Mr. Wolf has only deteriorated in my estimation over time. He has reached an all time low with his recent editorial (“Wipe out Rentiers with Cheap Money,” 5/6/14), where he argues that the cheap money policy used by central banks was here to stay, so get used to it. What makes his conclusion so tainted is that he understands the consequences of this policy. He even invokes the famous remark of Keynes regarding the “euthanasia of the rentier” where he supported the ruination of people who earn interest on their savings. Wolf is the unabashed mouthpiece for the ruling power elite. He clearly and correctly describes what this policy actually accomplishes — cheap monetary policy hurts most people in the economy, particularly workers and savers and redistributes wealth to the ruling elites. The losers from easy credit policy include the broad categories of insurance, pensions, and households. This long known result was recently confirmed in a study, referenced by Wolf, by the McKinsey Global Institute. Insurance is far more important than most people think. Insurance protects us against the loss of life (life insurance), our health (medical insurance), our homes (home, flood, and fire insurance), and our vehicles (car insurance). There is also general liability insurance and various types of business insurance. Insurance companies even offer incentives to be better drivers, to maintain safer homes, and to live healthier lifestyles, and they strive to eliminate moral hazard. Insurance companies are hurt by cheap money policies because their interest return on investments are now lower than required to meet their payout obligations. This hurts the companies and their policyholders because it requires higher premiums and raises the possibility of bankrupting insurance companies. 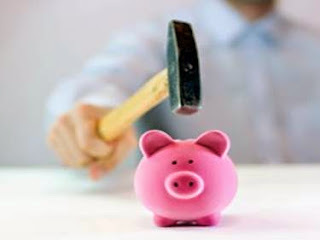 Pensions and retirement savings accounts are also hurt by easy credit policies. These institutions arose to address the problems associated with increased longevity brought about by increased prosperity. By saving during your working career you provide income for your retirement. Cheap money policy and low interest rates discourage saving and also makes it more difficult for pensions to earn returns on their investments necessary to make future payouts to retirees. The same is true for individuals who have retirement savings accounts. In order to achieve higher returns, pension funds and people saving for retirement have been forced into more risky investments. Savings accounts, money market mutual funds, certificates of deposit, and short-term government bonds earn less than 1 percent, and after taxes and inflation they are losing purchasing power. Hence, central banks have been forcing these people to invest in the stock markets and junk bonds and the possibility of large loses in the future. The class labeled “households” is basically everyone except the small number of people who benefit from cheap money policy. Households are harmed in a variety of ways, including the weak job market, declining real wages, and the negative impact on savings. It has also harmed them by encouraging households to take on extremely high amounts of debt, much of which comes with much higher interest rates. The winners from cheap money policy are the government, large corporations, and large banks in the US. Low interest rates clearly benefit borrowers with lower interest rates and governments, banks, and corporations are the biggest borrowers. In general, artificially low interest rates benefit capital and hurt labor. Cheap money policy by central banks helps banks, like subsidized flour policies would help bakeries. Banks are also helped by most forms of government bailouts. The easy money policy makes it easy for large corporations to borrow large amounts of credit at very low interest rates. It also forces stock prices up as alternative forms of savings, such as certificates of deposits, yield a real negative return. It has also made it very cheap for corporations to buy back their stock and to leverage their balance sheets. The stock market bubble is the direct effect of the cheap money policy of the central bank. Mr. Wolf and central bankers around the world have the idea that cheap money policies can increase stock prices and that this will lead to sustainable increases in investment, consumer spending, and increased aggregate demand. In reality, cheap money policies cause economic bubbles that are inherently unstable and subject to crash. It should be obvious that harming the workers and savers of society to benefit the wealthy ruling class is no way to get the economy back on track. Therefore, cheap money policy is a scam of gigantic global proportions. Achieving economic recovery and growth requires first knowing what caused the problem in the first place. A lack of aggregate demand is the effect, not the cause. A lack of aggregate demand is the crisis, not the cause of it. The cause of the crisis is easy money policy and runaway government spending and debt. Continued easy money policy and government spending will only make the negative consequences of the crisis even worse. The solution consists of: 1. Central banks should have no monetary policy and they should not interfere with interest rates. 2. Government budgets should be balanced and reduced over time. 3. Government regulations, subsidies, and taxes should be eliminated. 4. Land, labor, and capital should be transferred from the public sector to the private sector. And, 5. Programs that burden future generations should be ended. The horrible irony here is that when Keynes wrote approvingly of the euthanasia of the rentier class, he was speaking of a powerful class of monopoly capitalists and aristocrats. When Mr. Wolf speaks of the euthanasia of the rentier he is actually targeting “insurance, pensions, and households,” with a policy that has enormous financial benefits to the class of people that Keynes was targeting for extinction! Note: The views expressed in Daily Articles on Mises.org are not necessarily those of the Mises Institute. Mark Thornton is a senior resident fellow at the Ludwig von Mises Institute in Auburn, Alabama, and is the book review editor for the Quarterly Journal of Austrian Economics. He is the author of The Economics of Prohibition, coauthor of Tariffs, Blockades, and Inflation: The Economics of the Civil War, and the editor of The Quotable Mises, The Bastiat Collection, and An Essay on Economic Theory. Send him mail. See Mark Thornton's article archives.